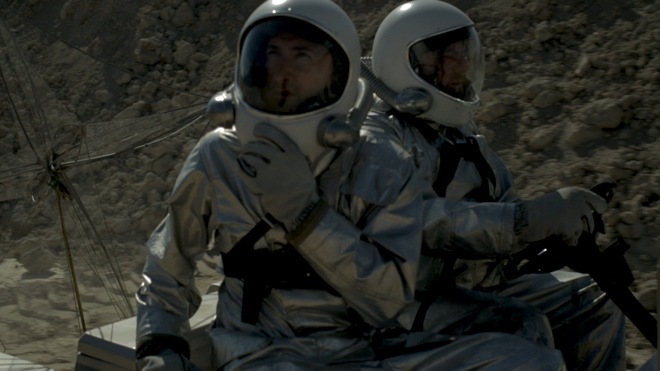 Pinback’s Rob Crow and Zach Smith touch down on a prehistoric planet in the new music video “Sherman,” exclusively premiered below. But their space boots follow in the obscure sci-fi footprints of 1962 cult Soviet film Planeta Bur. Crow has added his own fingerprints to the serial borrowing. He mashed all three films into visuals for Pinback’s extensive tour, which starts Nov. 9 in Philadelphia, in support of the indie rockers’ new release, Information Retrieved, released Tuesday by Temporary Residence Ltd.